effective for particle sizes down to 6-10 mesh. provide significant savings in both production costs and energy usage. 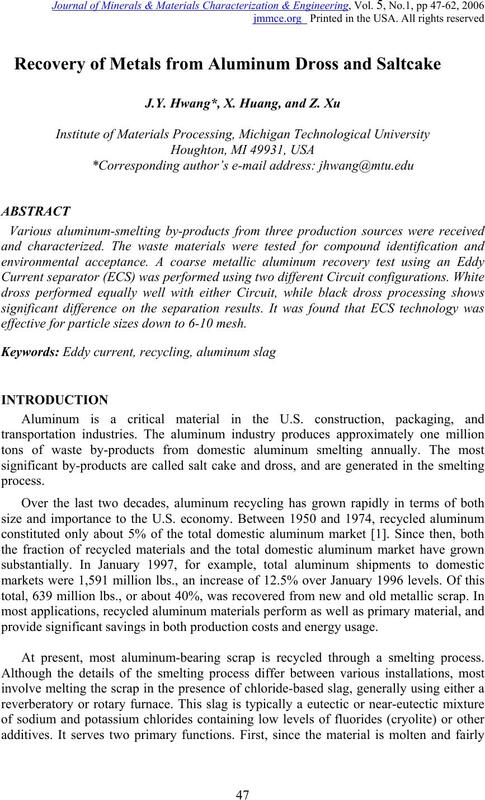 At present, most aluminum-bearing scrap is recycled through a smelting process. residual nonmetallics in the charge. metallic aluminum. It is normally disposed of in a landfill . concrete, and mine backfill grouts. promising methods have been developed based on the idea of eddy current separation . materials. 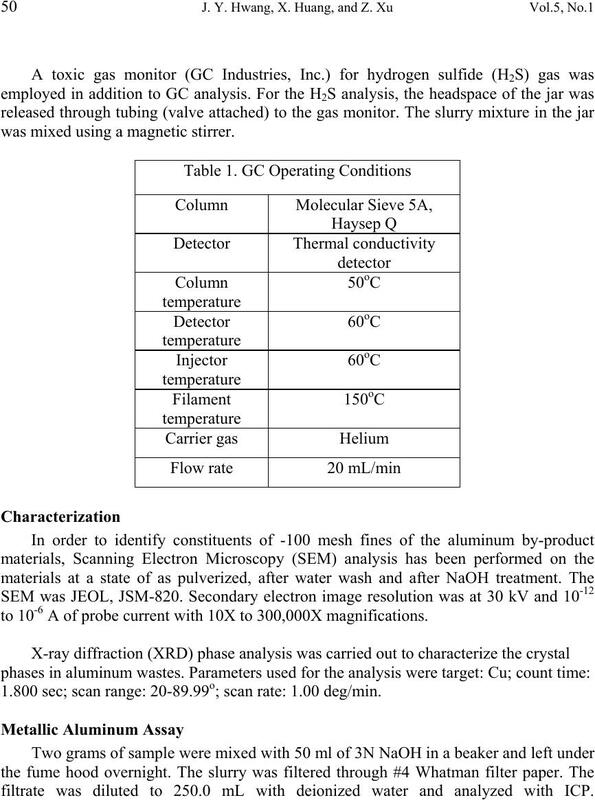 The δ/ ρ ratio of aluminum is 13.0 .
conditions listed in Table 1.
was mixed using a magnetic stirrer. A of probe current with 10X to 300,000X magnifications. ; scan rate: 1.00 deg/min. filtrate was diluted to 250.0 mL with deionized water and analyzed with ICP. Figure 1. Circuit 1 flowsheet. 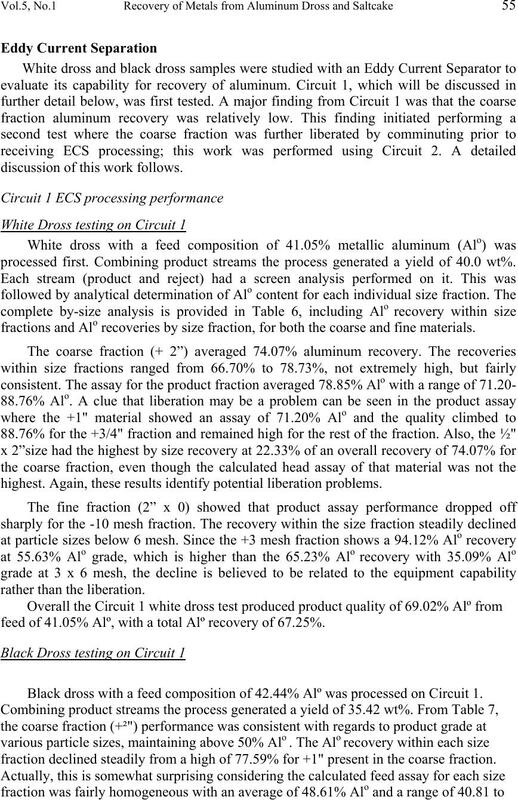 In Circuit 2 (Figure 2), white dross and black dross samples were crushed to -12"
liberation prior to ECS processing. was separately fed to an Eddy Current Separator. Figure 2. Circuit 2 flowsheet. 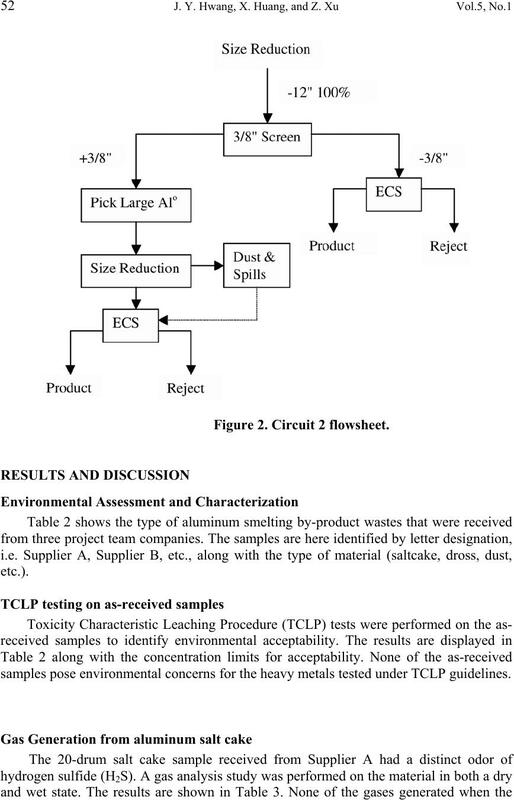 samples pose environmental concerns for the heavy metals tested under TCLP guidelines. salt cake was wet were found to be hazardous. gas evolution was observed when the salt cake is exposed to water. 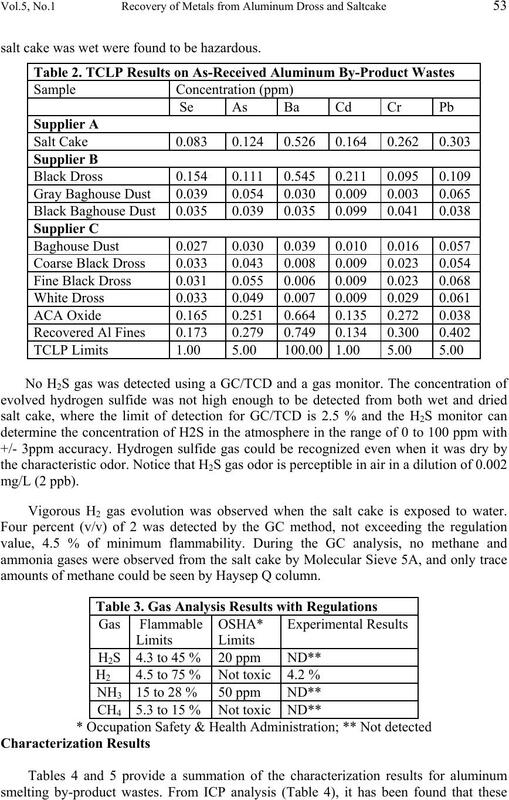 amounts of methane could be seen by Haysep Q column. Table 5. 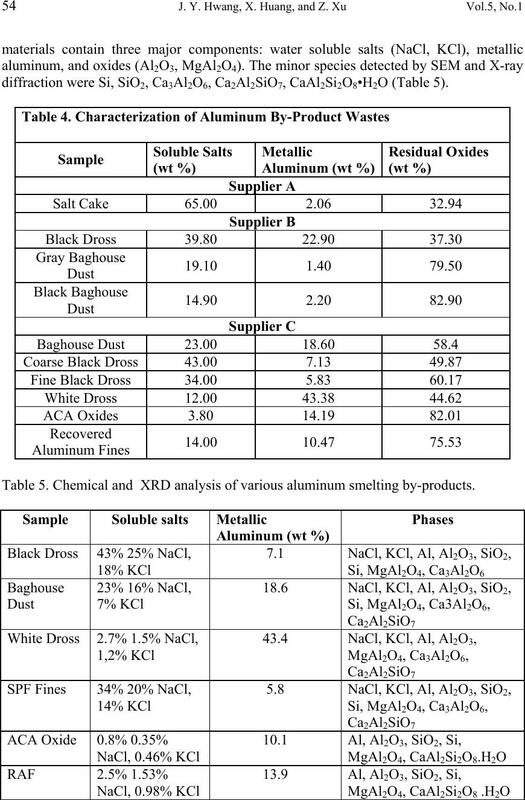 Chemical and XRD analysis of various aluminum smelting by-products. discussion of this work follows. processed first. Combining product streams the process generated a yield of 40.0 wt%. recoveries by size fraction, for both the coarse and fine materials. 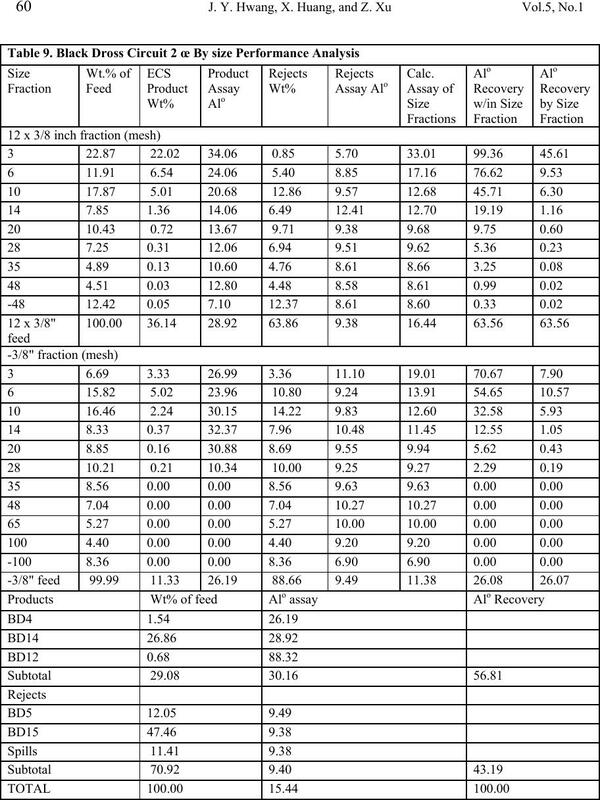 88.76% for the +3/4" fraction and remained high for the rest of the fraction. Also, the ½"
highest. Again, these results identify potential liberation problems. feed of 41.05% Alº, with a total Alº recovery of 67.25%. 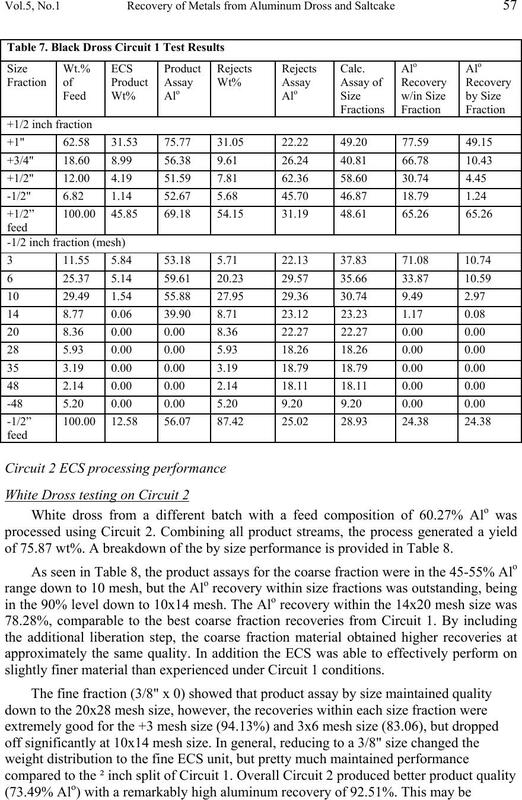 Black dross with a feed composition of 42.44% Alº was processed on Circuit 1.
fraction declined steadily from a high of 77.59% for +1" present in the coarse fraction. fraction, following the pattern established in white dross testing. 68.7 wt% for black dross compared to 57 wt% for white dross. liberation needs to be addressed. of 75.87 wt%. 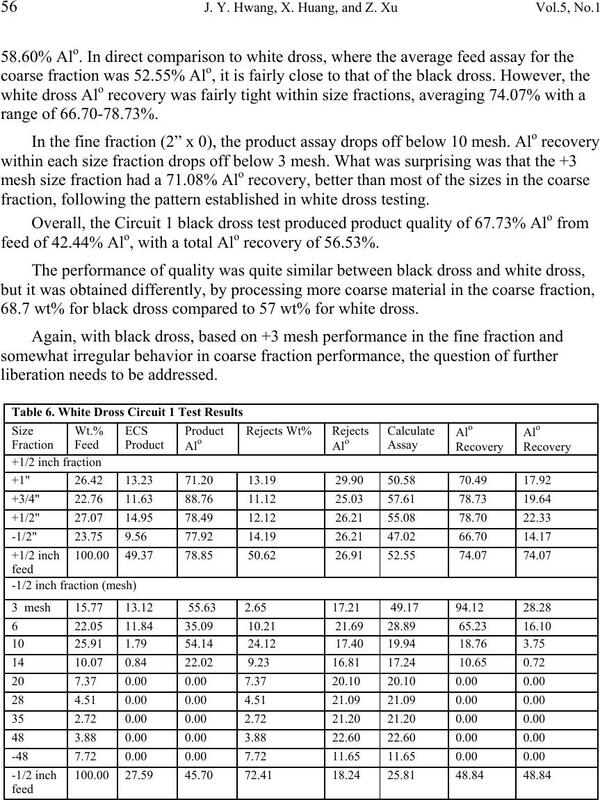 A breakdown of the by size performance is provided in Table 8.
slightly finer material than experienced under Circuit 1 conditions. 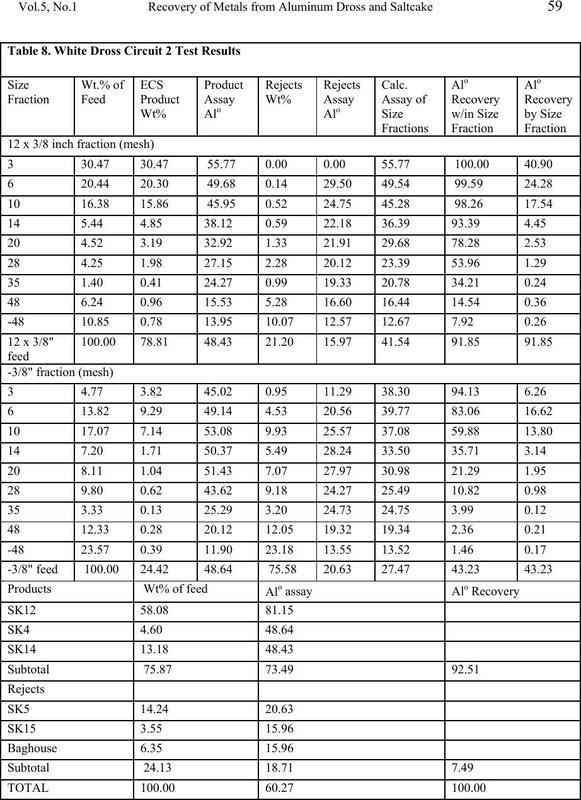 was processed using Circuit 2.
the by-size performance is provided in Table 9. Based on the equation the higher the index value, the more efficient the separation. and Circuit 2 white and black dross tests. 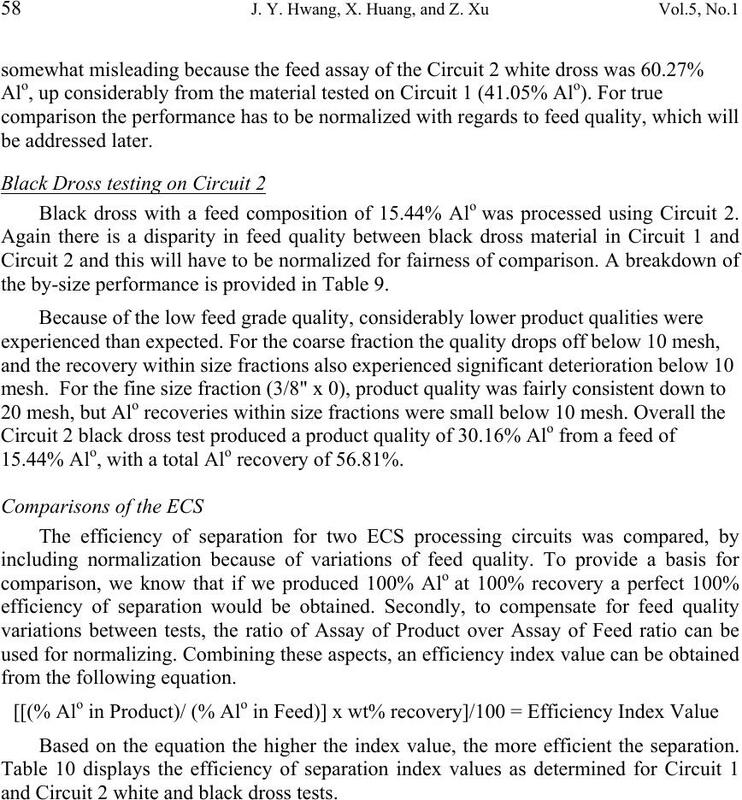 • White dross performed equally well with either circuit. liberation on the coarser fraction. dross is easier to upgrade. 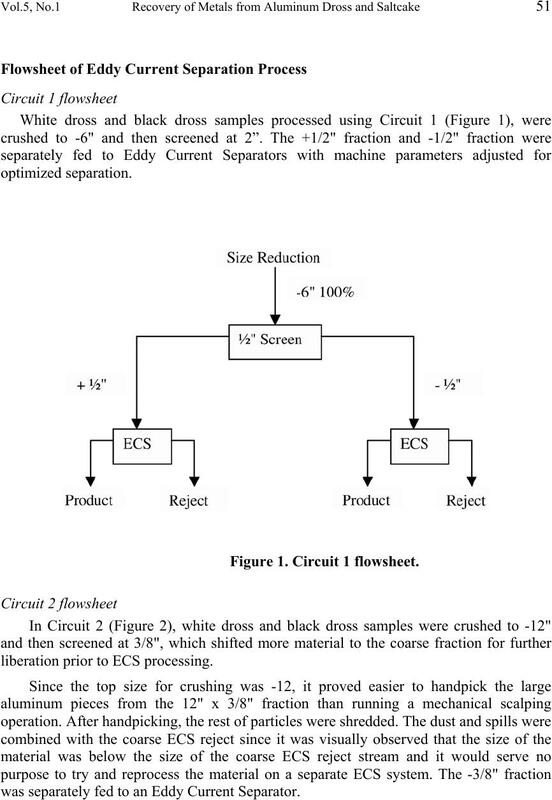 • ECS technology is effective processing down to 6-10 mesh size material. Funding for this research was provided by the U.S. Department of Energy. Symposium–Recycling of Metals and Engineered Materials, Warrendale PA, TMS, 1990. 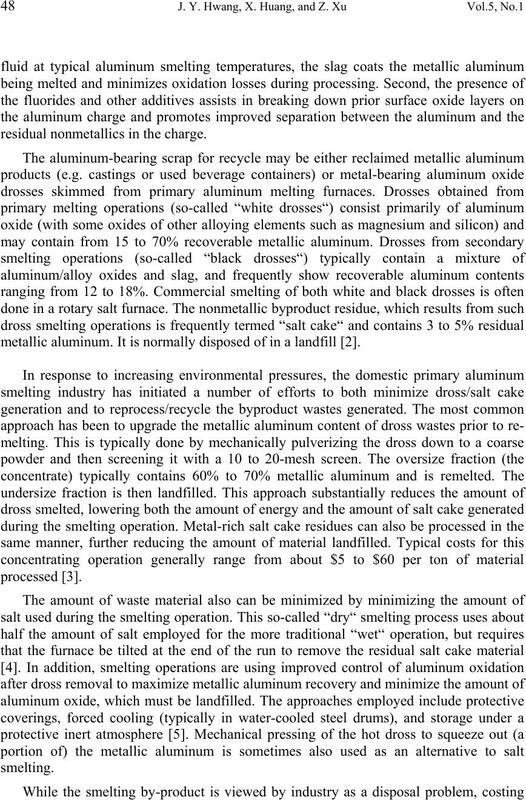 Recycling of Metals and Engineered Materials, Warrendale PA, TMS, 1990. p. 427. 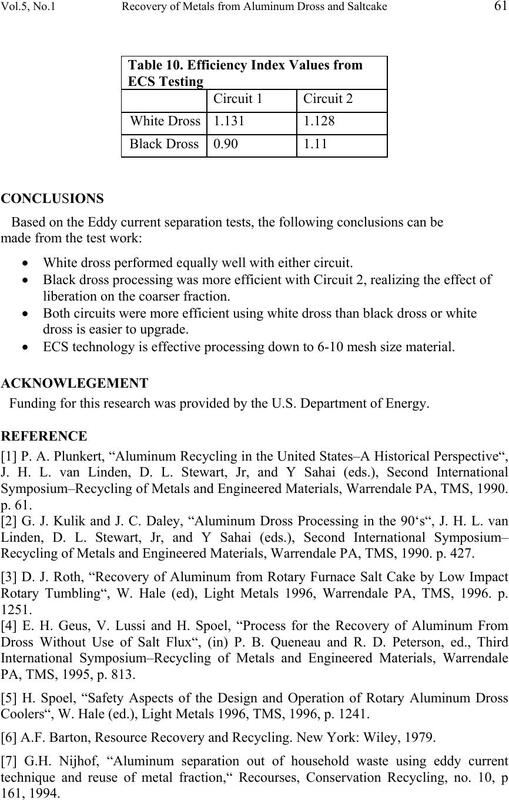 Rotary Tumbling“, W. Hale (ed), Light Metals 1996, Warrendale PA, TMS, 1996. p.
PA, TMS, 1995, p. 813. Coolers“, W. Hale (ed. 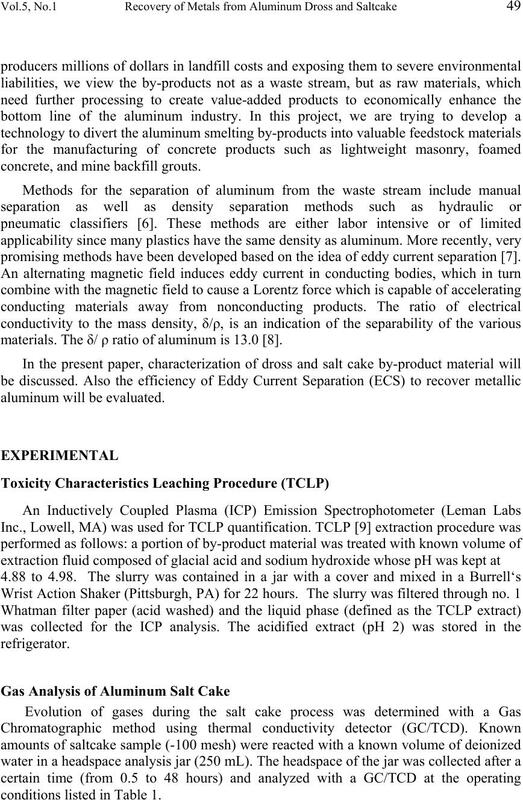 ), Light Metals 1996, TMS, 1996, p. 1241. A.F. Barton, Resource Recovery and Recycling. New York: Wiley, 1979. Exhibitors at ENVITEC, Bulk Solids Handling, 18, 145, 1998.